Trump’s next grift: Trump News. Trump is reportedly thinking about his next grift: a cable news network. Check your local listings. 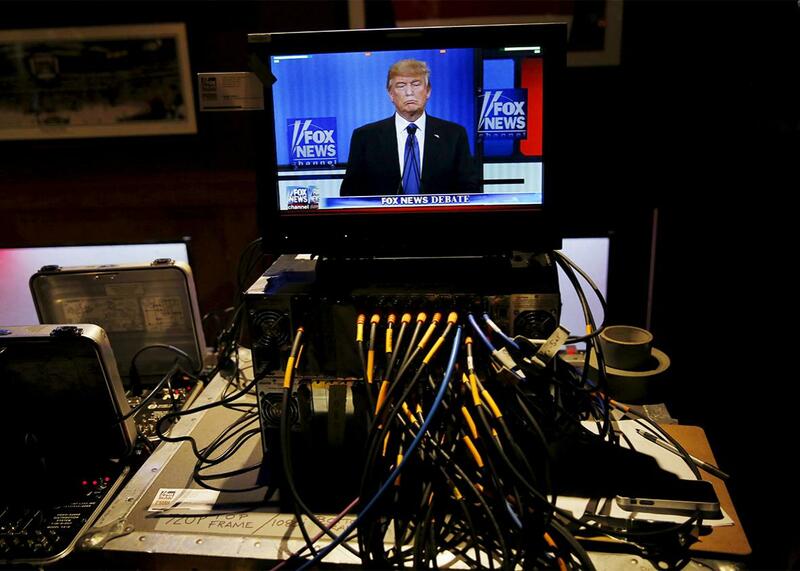 Donald Trump is seen on a television monitor at the media center of the Republican debate site in Detroit in March 3. We’re hardly a month into the general election, and Donald Trump is already spiraling in the polls. He is the most unpopular candidate in the race, and is among the most unpopular people in American politics, period. This was predictable. The same outrageousness and prejudice that won him crowds and votes in a crowded Republican presidential primary are poison to most Americans. Trump hasn’t changed, but his environment has. What makes this worse for the Republican Party is the real estate mogul’s disdain for traditional campaigning and disinterest in any of the things it takes to win an election, or even to stay competitive. He doesn’t want to contact donors, or hire a field staff, or run advertisements, or collect data, or even campaign in swing states. Trump’s main concern is doing television and holding rallies, a bizarre fixation if his goal is the White House. But that assumes he wants to sit in the Oval Office. Some have begun to wonder if Trump even wants the presidency. What if the Republican Party’s nominee has some other goal in mind? “Trump is indeed considering creating his own media business, built on the audience that has supported him thus far in his bid to become the next president of the United States,” reports Sarah Ellison for Vanity Fair, drawing from an unnamed source who says that Trump wants to “figure out if he can monetize” his newfound stature. It makes sense. Trump is a master of self-aggrandizement. He rode it to the GOP’s presidential nomination, and now he intends to ride it to something more immediately lucrative than leading the country—a cable news network, centered on his image and his message. Or at least that’s the theory. I have no doubt that this has been discussed, but there’s not enough evidence to say that a cable network was the plan or the endgame all along for Trump 2016. Trump has flirted with running for president enough over the past 20 years to suggest that he’s serious—that he believes he could be president of the United States. His refusal to do what it takes to win an election has less to do with some ulterior motive and more to do with his arrogance and narcissism. Whatever the case, whatever happens in November, the bracing thought arrived with the Vanity Fair story that Trump is here to stay. It is no small thing to win a major party nomination. Since the GOP’s founding in 1854, just 26 men have held the title of Republican Party presidential nominee. Seventeen of them became president. Assuming he leaves the Cleveland convention with the nomination intact, Trump will enter an exclusive club of Americans regardless of what happens in November. If he wins, he’ll be president-elect of the United States. And if he loses, he’ll be a bona fide leader of the GOP, a man who represents a sizable chunk of the party’s base—the revanchist minority demanding a return to the old order, where a certain kind of American (white and male) was the presumptive, predominant voice in national life. Think about what that means in practice. To win a nomination is to win a certain amount of deference and public influence, even after the election. As the GOP’s choice in 2012, Mitt Romney can still command cameras and attention. He gives endorsements, provides counsel, and has a network of relationships that shape and influence the party. In every way that matters, Mitt Romney is a national leader. Trump isn’t Romney and he isn’t running Romney’s campaign. If he loses, there’s a decent chance he’ll lose big, in a way that jeopardizes the GOP’s congressional majority. He’ll walk away from November a pariah, disdained by professional Republicans and hated by lawmakers, activists, and others invested in maintaining a strong and durable party. But that doesn’t mean he won’t have a voice in the larger conversation. He’ll still speak for millions of alienated, disaffected Americans. He’ll still channel their anger at the nation’s rapid cultural and political changes. He’ll still have the star power and resources to carve out a spot in the public eye, with willing allies and accomplices. He’ll still matter as a symbol for the ugliest, most destructive impulses in American life. If in 2017, Americans are met with another Orlando or another San Bernardino, Trump will likely be there, ready to criticize, condemn, and tout his “solutions” to the difficult problem of lone-wolf terrorism. The terrible truth is that this is not the end of Trump’s influence. At minimum, he has reopened the space for overt prejudice in national life, giving license to white nationalists, anti-Semites, and other noxious elements in American politics. And worse, he’s given them a template for success, of a kind. It’s too much to say that Trump, should he lose in November, will emerge from 2016 a kingmaker. There is every reason to belief he will linger as an inspiration to others who can polish his message of white reaction into something a little less abrasive, a little more respectable. Look carefully, and you see it’s already happening.